Musheer Hussain, Edward Fisher, Robin Youngs, Jonathan Fishman,	The Journal of Laryngology & Otology, Volume 130 Issue 8, p 699. G B Singh, D Kumar, K Aggarwal, S Garg, R Arora, S Kumar,	The Journal of Laryngology & Otology, Volume 130 Issue 8, pp 700-705. O Hilly, E Hwang, L Smith, D Shipp, J M Nedzelski, J M Chen, V W Y Lin,	The Journal of Laryngology & Otology, Volume 130 Issue 8, pp 706-711. K Karimnejad, M S Czerny, S Lookabaugh, D J Lee, A A Mikulec,	The Journal of Laryngology & Otology, Volume 130 Issue 8, pp 712-716. U A Kumar, S R Deepashree,	The Journal of Laryngology & Otology, Volume 130 Issue 8, pp 717-729. G Crundwell, D M Baguley,	The Journal of Laryngology & Otology, Volume 130 Issue 8, pp 730-733. S Jervis, D Skinner,	The Journal of Laryngology & Otology, Volume 130 Issue 8, pp 734-742. C C Yong, A Soni-Jaiswal, J J Homer,	The Journal of Laryngology & Otology, Volume 130 Issue 8, pp 743-748. A T Haymes, V Harries,	The Journal of Laryngology & Otology, Volume 130 Issue 8, pp 749-754. G B Morand, J Madana, S D Da Silva, M Roskies, K Sultanem, M J Black, A M Mlynarek, M P Hier,	The Journal of Laryngology & Otology, Volume 130 Issue 8, pp 755-762. Is weekend surgery a risk factor for post-tonsillectomy haemorrhage? A Patel, N Foden, A Rachmanidou,	The Journal of Laryngology & Otology, Volume 130 Issue 8, pp 763-767. 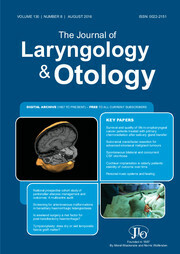 The Journal of Laryngology & Otology, Volume 130 Issue 8, pp 768-776. M Bannister, P Trotter, A Jawad, D Y Veitch,	The Journal of Laryngology & Otology, Volume 130 Issue 8, pp 777-780. T Tikka, A Opeodu, R Irving, J Murphy,	The Journal of Laryngology & Otology, Volume 130 Issue 8, pp 781-786. J J Homer,	The Journal of Laryngology & Otology, Volume 130 Issue 8, p 792.